The Nymphaeum of Miletus consists one of the most impressive fountain structures in Asia Minor. It was situated at the west part of the city between the North Agora (at the south), and the Gymnasium of Eudemus and the Capito Thermae (at the north). It was designed in the mode of a theatre’s scaenae frons. It deploys in three storeys and the façade’s wall is decorated with columns, niches and aediculae, in which statues were displayed. A characteristic feature of this specific type is the existence of two waterbasins, a basin for the collection of water in an upper level which supplied a second draw basin in a lower level. As it appears from its dimensions, it should have been a particularly imposing monument. It had an elaborate three storey columnar façade of Corinthian order. (20,25 m. length)The structure has an U-shaped groundplan due to the existence of the projecting side wings. The lateral projections were two storied, that is they were a storey lower than the facade and they were open (they didn’t had a rear wall). At the nymphaeum’s façade niches and aediculae were formed crowned either with volutes or with pediments. 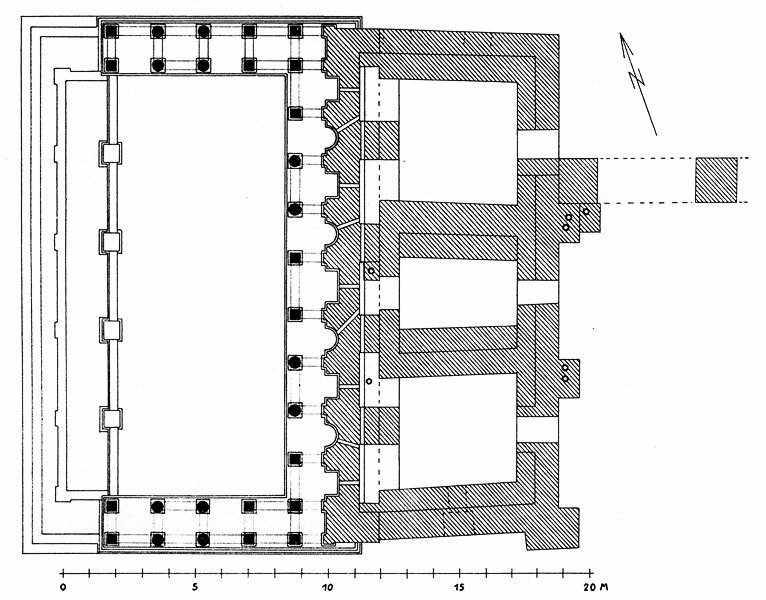 The alternation of these niches and aediculae was designed in such a way, so that each aedicule was crowned by a niche and every niche was crowned by an aediculae. Although this solution has some instability problems, it provides the monument’s architecture with an impressive decorative style. 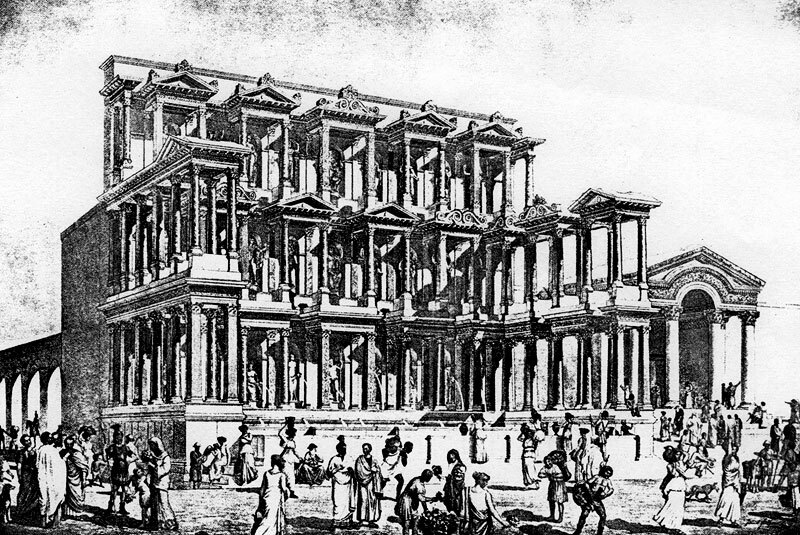 The same design in the columnar façade is to be found at the Library of Celsus in Ephesus. The columns of the façade were monolithic and unfluted. The pillars were either fluted or adorned with reliefs. 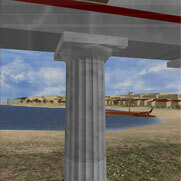 The columns and the pillars carried the horizontal marble architrave, which lay between the two storeys. The architrave of each storey followed a crooked line, which was dictated by the façade’s architectural elements, meaning the pavillions and the aediculae, and in succession it expended to the projecting side wings. It had a lavish sculptural decoration, since it was formed with multiple horizontal decorative elements, like series of astragals, Ionic and Lesbian kymation, relief floral ornaments with acanthus leaves and dentils. The frieze was adorned with relief vegetal motives , depicting a vineyard. This corresponds directly to the decoration of the colonnade of the façade of the Capito Thermae in Miletus, although the details in the Nymphaeum are rendered smaller and less acute. The statues that adorned the monument were placed inside the niches and the aediculae. The statues at the lower floor were placed in nine niches and they had a functional apart from a decorative character, since they functioned as fountain figures spouting water to the large collective basin below (16,15X6,39 m.). In front of this basin there was another smaller basin, from where the people drew the water. The sculptures found near the main water basin were ascribed to the decoration of the nymphaeum and they must have stood at the niches and the aediculae of the façade. The statues were smaller than life –size, and depicted figures of Gods and demigods. It is estimated that there were at least 27 figures, placed inside the 5 aediculae and the 4 niches of each storey. Assumingly, a large number of statues were also placed at the side wings. The restoration of the decoration, as well as the original setting of the statues are purely hypothetical, however the iconographical program must have included the local Pantheon of Miletus. At he first floor was placed the figure which probable depicted the god Poseidon. At the right and left side of the god, there were figures related with the see: a Nymph holding a vessel and a Nymph holding an oar.9 Beside them stood figures, probably holding a horn, offering the blessing for prosperity and fertility. These statues functioned as fountain figures, spouting the water into the large basin in front of them. There are also figures that seemed to form pairs and were probably placed in the projecting side wings of the Nymphaeum. There are two female figures wearing chiton, leaving the shoulder bare. They might depict the goddesses Artemis and Athena, while the two naked male figures are probable portraits of the sponsors of the building, Ulpius Traianus, the father of the emperor Traianus (98-111 AD) and the Roman proconsul L. Egnatius Victor Lollianus, who lived around the middle of the 3rd century AD. In the second floor stood the enthroned Zeus with Hera and Athena at his right side and Heracles and Asclepios between them, while at his left side stood Leto and Artemis, with Apollo and Dionysus between them. At the 3rd floor, inside the central niche was Atlas holding the world’s sphere and flanked by a Satyr and female and male figures, from which only scanty fragments are preserved. The architrave of the lower floor bears a latin inscription, which states that the Nymphaeum was built by Marcus Victor Traianus, father of the emperor Traianus (98-117 AD), who among other offices, was also the proconsul of the province of Asia during the reign of the emperor Titus (79-81 AD). The inscription was however carved during the Traianus period. It seems that the two lower storeys were erected at the end of the Flavian dynasty. Another inscription of the third storey’s architrave is written in greek and refers to embellishment of the Nymphaeum by the emperor Gordian III (238-244 AD), during 241-244 AD. However there are doubts whether this embellishment also included the statues, which adorned the monument. The edifice is today preserved in a good condition. A large part of the marble architectural members of the Nymphaeum were uncovered during the excavations. Most of them are today preserved in the area. From the lavish façade of the first storey the central and two out of four arched niches at the south are preserved. Regarding the sculptural decoration of the monument, most of the statues remain in Miletus, while some other have been transferred to Constantinople and Berlin.